Wasted space or public place? Having come up with this phrase on this blog a while back, I contacted a local architect to try and find out what it might mean. Thanks to him, local Green councillor Amy Kennedy and I met up outside the Chimney House with Lee Davies of Conran & Partners and Ben Meekings of Project Centre, which has worked on a number of major street schemes in London and elsewhere. This was a completely informal meeting – no group, party or company is involved yet, though the PCA will discuss it on 23 June. The basic idea is to create a public space that all parts of the community can use and enjoy. Schemes like these are known as Home Zones, and they work by removing the priority vehicles enjoy in ordinary streets. Vehicles still have access, but they don’t come first. 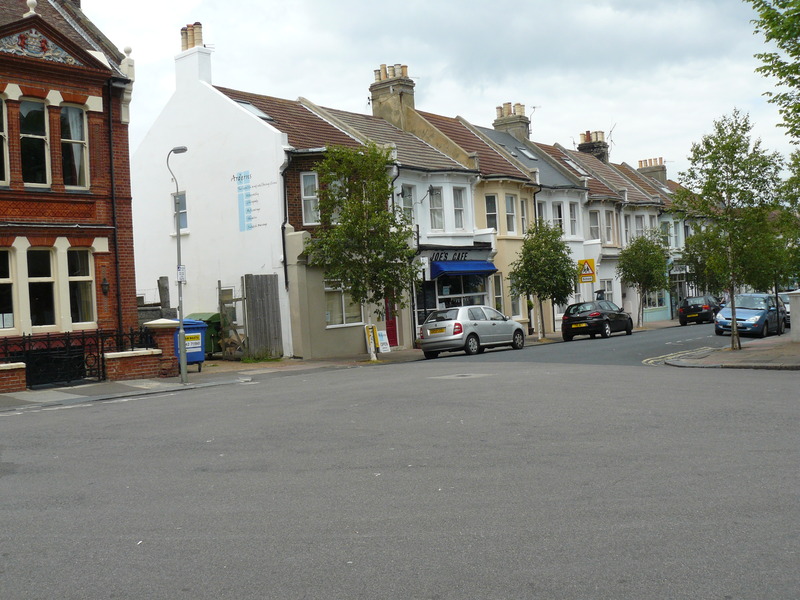 Typically the streets are resurfaced so that the distinction between pavements and roadway is removed. At the Exeter – Buxton – Upper Hamilton junction there is a large and underused space that could become a focus for the community – a spot we could be proud of and enjoy spending time in. It could also be good for local businesses, both existing ones and ones that might be attracted to an improved area in the future. Lee and Ben felt that there was potential to do something here, and few potential problems. The traffic is light, there’s loads of space to work with, and the area is well overlooked by homes, which discourages anti-social behaviour. Nor should parking be an issue. There would be at least as many parking spaces as before – and possibly even a few more. Those could be allocated to cars or to bikes (perhaps using more attractive stands than the current ones). Though it’s people like them who provide the expertise for schemes like these, they stressed that success depends on the community. Ideas and plans should come from the people who live in the area. Zones like these work if people are inspired by them and can see how they would be good for all concerned. That has to include people with disabilities, particularly blind or visually impaired people, whose organisations are very wary about schemes like New Road near the Pavilion. Any design would have to address their needs. As you can imagine, these schemes don’t come cheap, and times are tough. But this would be a long-term project anyway. If we decided we wanted to go for something like this, we could work towards having a plan ready for when circumstances are more favourable. Sorry about the length of this post, but Lee and Ben have given us a lot to think about. I think there are some really exciting possibilities here, and I hope you will too. The PCA now receives the monthly E-watch newsletter which details crime in Preston Park and Fiveways. This includes anything reported in Prestonville.